TransCanada Corp. is seeking firm financial commitments from companies seeking to ship crude oil from Western Canada to refineries in Eastern Canada. The Calgary-based company announced on Tuesday morning a bidding process that will allow interested producers to make binding commitments for space on the pipeline. Companies will have from April 15 to June 17 to enter into long-term commitments to use the pipeline. The open-season process follows a successful expression-of-interest phase and talks with potential shippers. TransCanada said if the next phase is successful, it plans to start seeking regulatory approvals later in 2013, and the oil could start flowing to Eastern Canada by late 2017. Should TransCanada’s pipeline east be approved? The proposal would be to convert 3,000 kilometres of the company’s natural gas pipelines to allow for crude oil to be transported. The company would also be looking at building 1,400 kilometres of new pipeline from Quebec into Saint John. The pipeline could carry between 500,000 and 850,000 barrels of crude oil per day from Alberta and Saskatchewan to the eastern refineries, according to the company. “We welcome such proposals, because they can generate thousands of Canadian jobs and long-term economic prosperity — particularly in Quebec and the Maritimes — for generations to come,” Oliver said. The federal minister said the proposed pipeline project must meet a series of regulatory reviews. If the project moves forward, Oliver said it would be an important piece of energy infrastructure for Canada. “Pipelines moving oil from Alberta to Quebec to New Brunswick would be among the most expansive and ambitious stretches of energy infrastructure in the entire world and would contribute to the energy security of Canada and all of North America,” he said. Officials from the Saint John-based Irving Oil Ltd. have said in the past their refinery could handle western crude oil. The Irving Oil refinery is the largest in Canada and can process 300,000 barrels of oil per day. Saint John also has a deep-water port and a liquefied natural gas facility. Oliver said he has recently toured the Irving refinery and the Ultramar refinery in Levis. The federal minister said he plans to tour Suncor’s refinery in Montreal in the coming weeks. 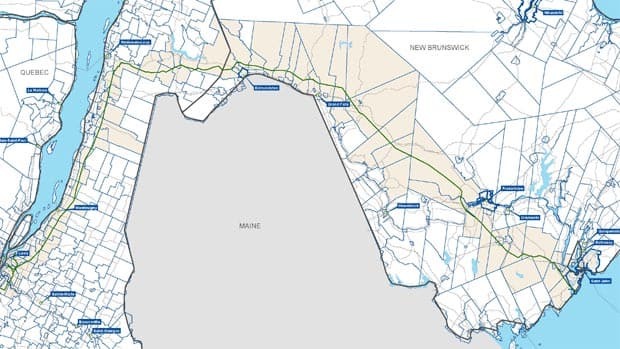 The New Brunswick premier said the pipeline proposal is a “historic initiative” for both the province and the country. “We envision New Brunswick as Canada’s next energy powerhouse and Saint John as the anchor of that powerhouse,” Alward said in front of more than 30 Irving Oil employees. “If we proceed, this project will strengthen our national and provincial economies and create jobs and economic growth today and for generations to come,” he said, suggesting the project has the potential to be as important to Canada’s economic future as the railway was in the past. Alward said the pipeline will create high-paying jobs in New Brunswick and will keep workers in the province instead of heading to western Canada to find employment in the oilsands. “I want to see the day when the mother or father, the son or daughter leave their New Brunswick home in the morning to go to work in the development of natural resources, they will return for dinner that night, not three or four weeks later,” he said. Alward spent three days in Alberta in February talking to Alberta Premier Alison Redford and oil executives about the possibility of the west-to-east pipeline. The project has the possibility of creating 2,000 jobs during the construction phase of the pipeline and a few hundred refining jobs after, according to some estimates. Alberta has been interested in the project, because oil from that province is now being shipped to the United States, where there is a glut. That means oil producers are getting $20 to $40 less per barrel than the world price. Those lower prices translate into lower royalties for the provincial government, and that is causing a potential multi-billion dollar deficit in Alberta. A pipeline to the Irving Oil refinery would allow Alberta producers to charge the higher world price. A new pipeline would also alleviate Canada’s dependence on foreign oil and increase the value of Canada’s crude oil through shipping to world markets from the deep-water port of Saint John, said Alward. Port Saint John president and CEO Jim Quinn welcomed the prospect of playing an integral role in bringing Canadian crude to global markets. “This opportunity for Saint John and our port is phenomenal,” Quinn said in a statement. The port, which for 50 years has been handling petroleum cargo for both import and export, currently handles the largest oil tankers in the world, as well as the largest crude carriers, he said. Friends of Sebago Lake provides comments on two Fryeburg water studies which study the altered hydrologic flow impacts on Wards Brook Aquifer and Lovewell Pond caused by ground and spring water extraction by local uses and Poland Spring, a subsidiary of the Nestle Corporation. Over 250 people packed the Waterville (ME) Opera House for the World Premiere of “Tapped” on Sunday, July 12. Stephanie Soechtig’s debut feature is an unflinching examination of the big business of bottle water. Grassroots organizations from Fryeburg, Kennebunk, Kennebunkport, Wells, Shapleigh and Newfield celebrated before the film with the Tapped production team. Photos – All photos copyright V. Kelly Bellis; can be freely used with proper credit. High-resolution pictures are available upon request. Robert Boilard said he feels the river, “which has taken a lot of beatings from the years back,” remains threatened and should be a top priority for state and local leaders. Any attempts by bottled water companies such as Poland Spring to draw more resources from the aquifer should be viewed with skepticism, he asserted, because tens of thousands of people already derive their drinking water supply from the Saco River aquifer. “That water’s more important than oil,” said Boilard. In 1845, when the Ricker family opened Maine’s renowned Poland Spring resort, the aquifer’s supposed healing properties drew sufferers of assorted maladies to “take the waters.” Hiram Ricker, the original landowner’s son, was convinced the spring water cured his chronic indigestion. Today, more than 160 years later, Poland Spring’s association with taking the waters has a whole new meaning. As the bottled water producer, now under foreign ownership, expands its reach to nine locations in Maine, a whole host of concerns are bubbling up about large-scale commercial water extraction. The controversies — ranging from increased truck traffic to Europeans profiting from a local resource — often begin as discussions about local zoning rules but shift into heated discourse about Maine’s identity on several fronts. REBUTTALS #2 & #3 by Tim Copeland and Steve Carroll were printed by the Portland Press Herald here. REBUTTALS #4 & #5 by Floyd Folsom and Jamilla El-Shafei were later printed by the Portland Press Herald here. Listening to my basement sump pump hard at work the other day, I got to thinking. How many gallons a day, I wondered, flow into and out of my basement during these waterlogged days of early spring? Which in turn made me wonder: How much water falls on our 1.86-acre yard in a given year? Have you noticed a shift in the dialog around climate change lately? There’s less talk of prevention, or even avoiding the worst of it, in favor of finding ways of adapting to the coming changes. Read Martin & Barbara Britten’s excellent letter to the Editor. The state’s highest court has ruled in favor of Poland Spring in a case over its efforts to build a water pumping station in Fryeburg. Four years after Poland Spring applied to build a water pumping station in Fryeburg, Maine’s highest court on Tuesday heard arguments from the water bottling giant and opponents who have prevented the project from moving forward.